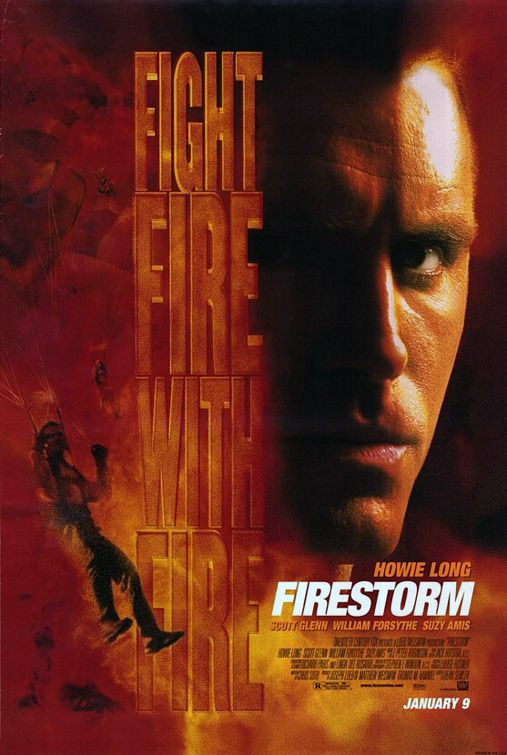 A smokejumper fights a blazing forest fire and a gang of escaped convicts. VIOLENCE/GORE 8 - Lots of intense action violence, but surprisingly little blood and gore. A man is stabbed in the jugular and dies (some blood). A man is hit in the chest with a shovel. Several men are killed by shotgun blasts (some blood and bullet holes). A woman is back-handed and kicked. A man holds a woman at gunpoint. Two men fight with axes in a burning cabin. A man is shot three times in the forehead (no blood, but the graphic bullet holes are shown). A man is pushed off a cliff and is killed on the rocks below. A man is hung upside-down from a tree and shot to death (no blood). A man is shot in the chest (no blood). A man is shot in the knee (some blood) and a man is shot in the arm (some blood). A man throws an axe at another man, hitting him in the neck. A man is burned alive and dies. LANGUAGE 6 - 2 F-words, 1 anatomical reference, 4 scatological references, 7 mild obscenities. DISCUSSION TOPICS - Arson, kidnapping. MESSAGE - Don't play with fire.